Teargas enveloped Istanbul as demonstrators defiantly merged onto the city's symbolic Taksim Square, where they hold May Day protests every year. The government banned all events there this year, because the square is under construction. As protesters and police clashed they turned the 15 million strong metropolis into a war zone, leaving behind destroyed property and reportedly dozens of injured people. To get a grip on the increasing number of protesters, Turkey's police fortified their ranks with four planes full of officers transfered [tr] from other cities. Among the injured were four journalists and a teenage high school student who suffered head injuries [tr]. and is in critical condition at the hospital. 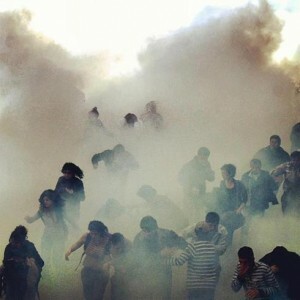 Opposition politicians affected from gas and police brutality were also hospitalized [tr]. 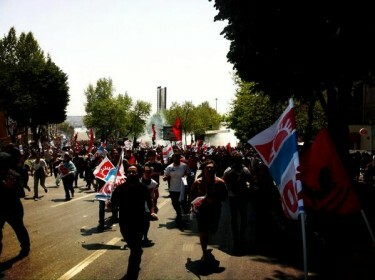 Istanbul demostrators under teargas during Labor Day celebrations. Photo by Burak Kara. Used with permission. Taksim Square, the usual venue for Istanbul's Labor Day demonstrations has been under construction for months, to help relieve the bottleneck of traffic that develops around it. 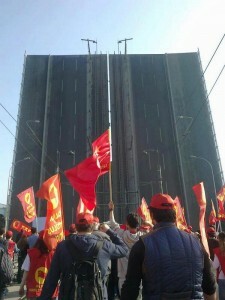 City authorities and the unions who insisted on celebrating the day at Taksim, had been in negotiations to find alternative venues, but that talks failed on April 30, 2013. The city administration immediately issued an order to cancel all public transportation between the Asian and European sides of Istanbul that lead to Taksim Square. Later, during a press conference, Istanbul Governor Mutlu banned all events at Taksim on May 1st. @aslitunc: İstanbul is under police siege today, Public transport banned, roads blocked, pepper spray used extensively, police attacks demonstrators. 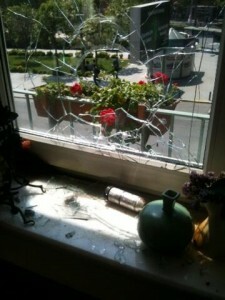 Damage caused by teargas canisters to homes. Photo tweeted by @farkindayimm, used by permission. 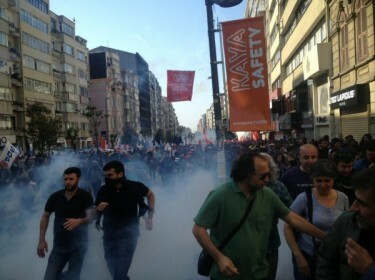 The International Trade Union Confederation was quick to condemn police brutality in Istanbul. After a day of brutality leading to injuries, and irresponsible and sometimes outright outrageous comments by government officials [tr] and journalists [tr] alike, all went home for an evening of Turkish TV series and business as usual.